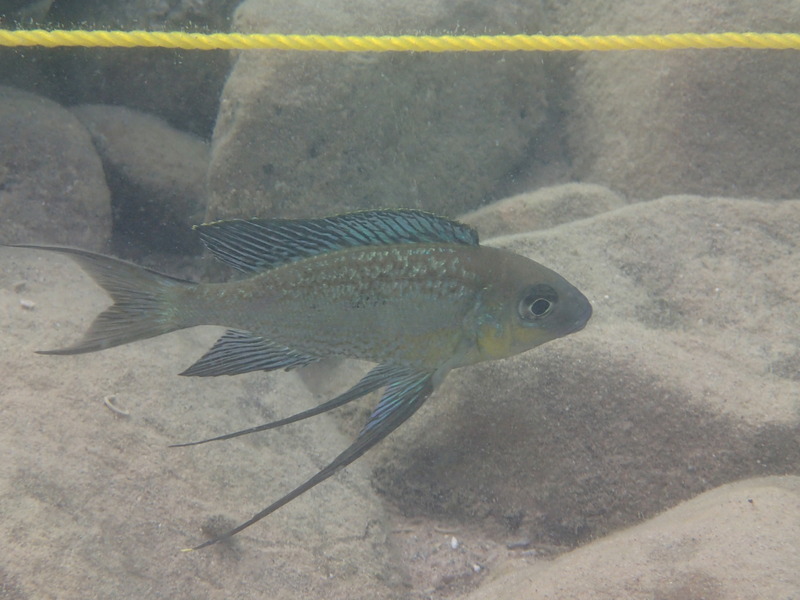 Cichlid of the Week: Cycanthopharnyx furcifer – will you come and party in my (sand) castle? This week’s cichlid is one of several species commonly known as Featherfins. One look at their fins should make it perfectly clear why. That’s hardly what is most interesting about them however. As I alluded to in my last post, it’s about that time that a young male C. furcifer starts to think about finding a mate and making some little C. furcifers. The first step is to build a bower, which essentially is an underwater sand castle. Right now there are tons of these just offshore from where we are staying. Each male builds a ring of sand up to about a meter or so in diameter and roughly 30 cm in height. They are meticulous in their maintenance of their bower, and continuously add more sand, smooth out edges, and run off any fish that tries to get too close. Once their bower is ready, the show begins! As females pass by to check out the quality of the castle, the males flare out their fins, brighten their colors, and show off more or less continuously. If the female approves, she lays a few eggs in the middle of the bower. When she turns around to pick up the unfertilized eggs (more on why in a moment), the male drags his pelvic fins in the sand in front of her. The yellow tips are known as “egg mimics”. The female thinks she’s missed a few eggs and swims after them, at which point the male ejaculates in order to fertilize the eggs in her mouth. This may repeat several times until the female has a mouthful of fertilized eggs. C. furcifer is a maternal mouth brooder, which means the female will keep those eggs, and eventually the fry in her mouth until they’re old enough to live on their own. When the fry are free-swimming, they will swim out of their mother’s mouth to go catch food, and dart back in at the first sight of danger. Previous PostPrevious Internet has returned!